It sounds like something straight out of a horror film: being forced to wade through your own waste just to eat a meal. Every day, the pool of feces and urine grows deeper, and when you emerge, it hardens and dries to your hair and skin, resulting in sores and painful ulcers on your body. But this isn’t some new Hollywood blockbuster—it’s reality for cows on a North Carolina dairy farm. After receiving a disturbing tip, PETA obtained shocking video footage of cows forced to live in their own corrosive, bacteria-laden waste—while walking to and from the milking parlor, while eating, and while sleeping, with no grass, straw or bedding to lie down on to rest. The cows—whose sensitive noses can smell odors up to 6 miles away—cannot escape the stench of the waste or the flies that swarm around them. The manure splashes onto cows’ udders moments before they are milked. It is caked on their limbs, and it is virtually impossible to clean cows’ flanks and udders before milking, which creates a serious food safety threat. Cows must stand on slippery meatl grates while milk - intended for their calves who have been taken from them - is mechanically sucked out for human consumption. Cow named "2" has bones that sharply protrude from her emaciated body. She is standing on a slick, manure-coated floor just before entering the milking "parlor." All this—and the serious, painful infections of cows’ skin and hooves that have resulted—is because the dairy’s waste pit has not been emptied for so long that the manure in it has hardened. One cow, identified only as “2,” had an untreated, overgrown right hoof. A thick layer of manure was caked on her legs. 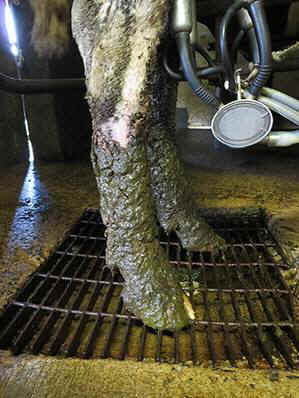 She hobbled out of the milking parlor because putting weight on her overgrown hoof caused her severe pain. Her bones protruded sharply, and she was emaciated. Cow “188″ was little more than a skeleton. Producing milk requires cows to expend a tremendous amount of energy. Cows denied proper nutrition and care can quickly become emaciated. Day after day, cow “6″ bled from her nose, attracting more flies. She may have had a foreign object in her nose or an infection deep in her sinuses. PETA alerted local law-enforcement officials, the N.C. Department of Agriculture & Consumer Services, and the N.C. Department of Environment and Natural Resources to conditions of and for animals at the farm and asked authorities to ensure that adequate care is provided to the cows and also to conduct emergency inspections. Just one day after PETA released eyewitness video footage, the N.C. Department of Environment and Natural Resources reportedly announced that it had cited the farm for six violations of state law. The agency reportedly corroborated PETA’s findings, reporting that “animal waste was observed [up] to 3 feet deep” where cows were made to stand, eat, walk, and try to rest. According to news sources, the farm has 10 days to correct these violations and the agency is considering fining the farm. The only way to ensure that no animals suffer for your milk, ice cream, yogurt, and cheese is to GO VEGAN. And SHARE this information.